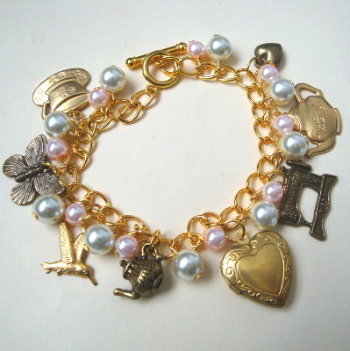 This pretty vintage inspired charm bracelet has a collection of brass and antique bronze charms with a nostalgic vintage style. There is a gold plated brass heart shaped locket and a tea cup, teapots, butterfly, hummingbird, sewing machine, chunky heart charms interspersed with pale pink and white glass pearls beads. The chain is gold plated and fastens with a toggle clasp. The bracelet is approximately 7.5 inches long, but I can make it longer or shorter if required.